Holiday shopping can be extremely stressful. It’s not just trying to find that perfect gift, but getting around to every store, and dealing with crowds & traffic can be very frustrating. So, we find ourselves gravitating towards stores that can provide it all: women’s clothing, men’s clothing, kid’s clothing, great shoes & accessories, and the brands we love. Lucky for us St. Bernard Sports is close by and has a great website, so we can shop in store or online without ever having to deal with the craziness of mall parking! And, we have a fun event planned next week. 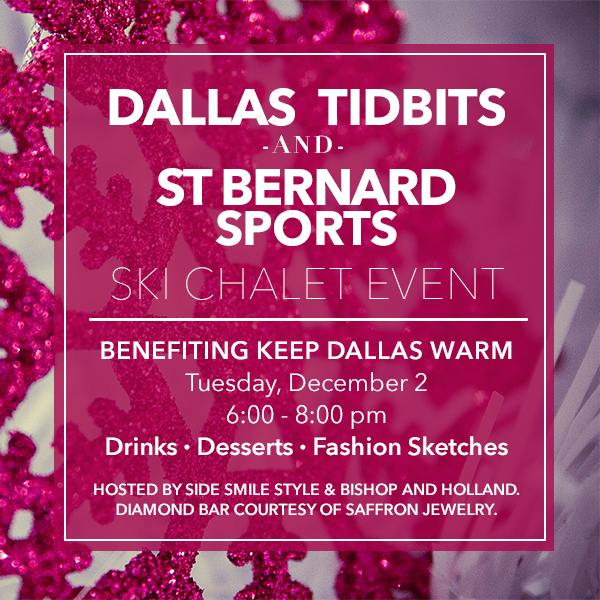 Join us, along with Ashley Aspinwall of Side Smile Style, at St. Bernard’s Sports Dallas on December 2 from 6-8 p.m. as we celebrate at Dallas Tidbits’ “Winter Ski Chalet” party. Come enjoy hot toddies & have your fashion sketch made while you shop for your favorite winter wardrobe necessities & gift giving. Bring a coat for St. Bernard Sports annual coat drive supporting Keep Dallas Warm, and receive $20 off your $100 or more same day purchase. You will also be entered for a chance to win a GoPr0. Shopping & doing good – what a perfect combination. We can’t wait to see you there!